Capture one soul from each of the ten races of Tamriel. Once you've met the requirements, speak with Casta Flavus, or activate the shrine directly. Hermaeus Mora will instruct you to collect one soul of each race. You will receive Hermaeus Mora's Soul Gem and the Mora's Soul Trap spell to complete this task. Once all souls have been collected, return to the shrine and activate it. You are rewarded with the Oghma Infinium which will permanently boost a series of stats that you must choose from a list. If the requirements have been met, you can proceed directly to the shrine and begin. If you have not yet met the requirements, you will be told by Ri'Jirr: "You have not yet followed the path required to speak with the Lord Hermaeus Mora". Unlike all other shrines, you will not be given any clues as to what is required, nor will a quest be added to your journal. Once the requirements have been met, Casta Flavus will appear the next time you sleep and inform you that you are now ready to start Hermaeus' quest. You must have completed all 14 of the other Daedric Shrine quests. You must have at least started the Blood of the Daedra quest (the point in the main quest where Martin asks you for a daedric artifact). It is possible to have finished the quest, but that is not a requirement (in other words, it is possible to use this quest's reward, the Oghma Infinium, as Martin's daedric artifact). You can do this quest even if you keep Umbra in Clavicus Vile's quest (although you must visit Clavicus Vile's shrine and tell him that you will not give him Umbra, thus completing the quest). The Shrine itself is located on a remote plateau deep within the northwestern portion of the Jerall Mountains. It is due west of Cloud Ruler Temple and due north of Sancre Tor. Northwest of Sancre Tor, at the top of the long flight of stone steps, there is an unmarked road that leads straight to the shrine. The road's stairs and bridges make it possible to easily traverse the mountains, but several enemies will be found along the road. No NPC will give directions to it. I see you have served my brethren, and now you come to serve me. I am Hermaeus Mora. Past, present, and future are as one to me. My followers seek to perform a divination. For this, they need souls, one of each of the sentient races. You will provide these. I give you a spell to trap these souls. Return to me when you have finished. When you do, I will further your journey on your true path. Hermaeus Mora will ask you to capture one soul for each of the 10 races of Tamriel. He will give you Hermaeus Mora's Soul Gem and the Mora's Soul Trap spell. The soul gem will only work for this quest and it can only capture souls that are trapped with this unique spell. This spell is cheap to cast and lasts 120 seconds. One way to complete this quest if you don't want to murder innocent people is go vampire hunting: Vampires are not undead, and are classified as NPCs, therefore their souls count. However, Argonian and Khajiiti vampires do not exist. Try the Vampire Dungeon page for a list of places where you can steal vampire souls. If you haven't started fighting in the Arena yet, this would also be a good opportunity to gain all of the souls. Until you get promoted to Warrior, which is the fourth rank, every race appears at least once. Rockmilk Cave between Bravil and Leyawiin. The large number and different types of bandits and marauders fighting likely results in all races, except for Bretons, being present. Each of the following links leads to a page listing all named NPCs of that race in the game; also provided are generic NPC enemies that can be of each race. Altmer: Necromancers, conjurers, and marauder battlemages. Argonian: Marauder archers. Also, Veyond Cave (north of Bravil) is filled with hostile Argonian tribesmen. Breton: Necromancers, conjurers, and bandit hedge wizards. Dunmer: Bandit bowmen and ringleaders. Imperial: Marauder archers, warlords, and the Hackdirt Brethren. You have served me well, and I am pleased. I give you this, the Oghma Infinium. Knowledge given by me to Xarxes is recorded within. Read it, and gain knowledge of yourself. Go now. Learn, and remember. The book that Hermaeus Mora gives you, the Oghma Infinium, is a book that when read will permanently boost a series of stats for your character, based on a list of choices that you must choose one of. It is possible to trigger this quest without receiving Daedric Artifacts from each of the other 14 Daedric quests; officially failing a Daedric quest also counts. For example, if Melus Petilius dies, Molag Bal's quest immediately ends without any chance of a reward; however, Molag Bal's quest still counts as far as Hermaeus Mora is concerned. In general, as long as the Daedric quest is in your list of completed quests, it will count. The two exceptions are Malacath's and Namira's quests, which must be finished correctly (see those quests for details). Your Quest log will update for each soul you capture; if it doesn't update when you are sure you had soul trapped a new race then your game has become bugged. The Oghma Infinium is a Quest Item and cannot be removed from your inventory until you use it. Mora's Soul Trap is not a true Soul Trap spell: it does not trap creatures in standard soul gems and it cannot be used to create Black Soul Gems. Furthermore, even though standard Soul Trap spells are in the school of Mysticism, Mora's Soul Trap is in the school of Alteration, and will give you Alteration skill points when used. Do not cast the soultrap spell on two different beings (or twice on the same being) within the 120 second time-frame of the spell. This will cause the spell to stop functioning correctly on all future casts regardless of whether you kill the NPCs that you double-cast on or not. A workaround for all platforms: Cast the soul trap on an unwanted NPC and then cast it again (within 120 seconds) on the NPC you actually want to trap (at this point, if everything was well a pop-up message would appear telling you that you can only soul trap one person at a time). Now kill the second NPC and you should trap their soul successfully (assuming you needed their soul in the first place!). If this does not work, cast the spell on an invalid target (e.g. a crate, barrel, horse) and then on your desired target. All ten races can be collected this way, without having to revert to an older save. Occasionally you will not be able to soul trap one of the races. ? Saving your game to a new save (be sure to not overwrite the last save made before the start of the quest), quitting out of the game entirely, restarting, and reloading can fix this problem. Another method is possible. Cast Hermaeus Mora's Soul Trap spell on an NPC two times within 120 seconds, and within the same time period, cast the spell again on the NPC you wish to capture. You will not get a message stating "You cannot cast this spell on multiple targets", but the second NPC is now able to be trapped. If saving and reloading does not work then you may have to load a game that was saved prior to the start of Hermaeus Mora quest and redo the quest. You can use console commands to bypass the rest of the quest. The command player.setstage 000146AF 40 gives you automatic credit for capturing all 10 souls. A reliable fix that saves you from reloading an earlier save game is to cast the spell on two separate NPCs until you are interrupted by a message saying: "You cannot cast the spell on two separate souls at once". Once you've gotten that message, do not cast the spell again, but find a safe place instead and use the wait function. After that, the spell will work properly. There are a couple of bugs associated with this quest's reward. These bugs are detailed on the article about the Oghma Infinium. 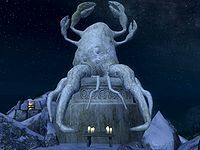 10 A man has told me that Hermaeus Mora wishes for me to visit his shrine. 20 Hermaeus Mora wishes for me to gather for him ten souls, one of each of the races. 30 I've captured the soul of an Argonian. 31 I've captured the soul of a Breton. 32 I've captured the soul of a Bosmer. 33 I've captured the soul of an Imperial. 34 I've captured the soul of a Khajiit. 35 I've captured the soul of a Dunmer. 36 I've captured the soul of an Altmer. 37 I've captured the soul of a Nord. 38 I've captured the soul of a Redguard. 39 I've captured the soul of an Orc. 40 I have gathered a soul from each of the ten races for Hermaeus Mora. I should return to his shrine. 100 Finishes quest Hermaeus Mora was pleased with the souls I brought him. He has rewarded me with the Oghma Infinium. It is possible to use the console to advance through the quest by entering setstage DAHermaeusMora stage, where stage is the number of the stage you wish to complete. It is not possible to un-complete (i.e. go back) quest stages. See SetStage for more information. Esta página foi modificada pela última vez à(s) 08h22min de 1 de junho de 2015.